The sleeping habits of horses are somewhat different than humans. Most human sleep is usually a long stretch – about eight hours in a 24-hour day. Horses rest for short periods during the day more frequently. They are not strictly nocturnal or diurnal, like most humans. Horse’s sleeping patterns change depending on their age. Foals lie down for frequent naps and spend about half of their day sleeping until they are about three months old. As the foal gets older, the frequency of the naps becomes less, and they are more likely to stand rather than lie down. The weather can make a big impact on how a horse sleeps. During really cold, wet and nasty weather, your horse may not be able to get comfortable enough to sleep. Bringing your horse in or making sure it isn't harassed when trying to nap in a run-in will help your horse relax. Your horse needs a comfortable secure place to rest, whether it is stabled or kept our on pasture. Mature horses most frequently rest in a standing position. The 'stay apparatus' of the forelegs and 'check apparatus' (functions of the leg tendons and ligaments) of the hind legs allows them to rest and relax while not falling down. Lying down is actually more stressful for a horse than standing. Their own weight causes pressure on their internal organs. However, most horses will lie down for a brief rest every day if they have a comfortable place to do so. Some will become so relaxed that they twitch and snore, just like a dog. That's why it's important to provide a dry, sheltered area like a run-in shed or roomy stall, so your horse can stretch out safely. Adult horses sleep for about three hours each 24-hour period. The length and type of sleep is affected by diet, temperature, workload, gestation and gender. The period of each sleep phase is very brief, lasting only a few minutes at a time. 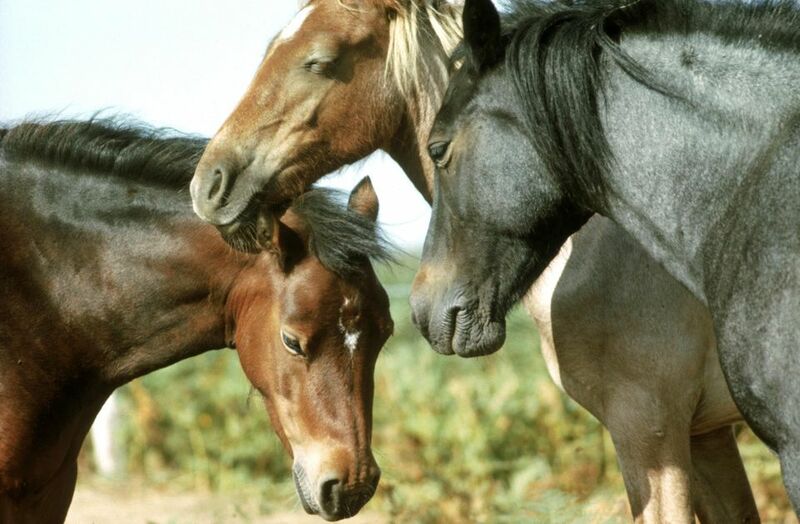 Young horses tend to sleep more than mature horses. Senior horses may doze more frequently. It is true that horses sleep standing up. A sleeping horse will most carry its weight on the two forelegs and one hind leg. One hind leg will relax with the hoof resting up on its toe. The rotation of the hips triggers the stay function of the hind legs. The head and neck droop, and during deep sleep, the ears are relaxed, the eyes close and the lips may droop. Some horses do sleep stretched flat out on the ground and may even snore and twitch as though dreaming. This may have been equivalent to the REM phase of sleep in humans. Of course, apparent snoring may be caused by the increased weight on the respiratory system. Horses will lie down to sun themselves, and it is not unusual for several horses to lie down at the same time for a communal sun bath on a warm spring day. Often while several lay down, one or two others will remain standing as if on watch. Horses tend to spend less time lying down in cold snowy conditions, although on a sunny day, some will snooze stretched out in the snow. Each horse has its own sleeping habits. Some will sleep only at night while others sleep during the day as well.